I didn't want to sleep tonight, anyway. The future used to be something to look forward to. Detective Daniel Lazarski, likeness and voice provided by Rutger Hauer, is tasked with solving a series of grisly murders in future Poland. There’s something amiss in this socially-stratified place, and nothing is quite as it seems. Cue intrigue. 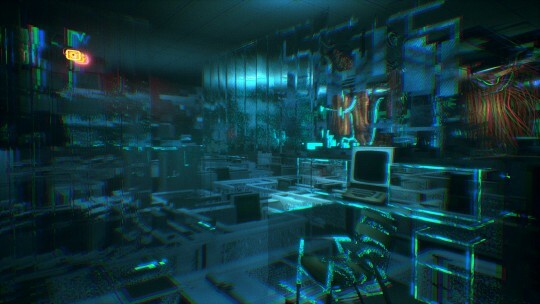 Observer is oppressively baroque in its depiction of cyberpunk. Oodles of cables line every nook and cranny. Flickering holographic commercials wedged into every crevice. It is a game set permanently after midnight, and Observer’s 2084 Krakow is a bestial place. There’s a density that should absolutely not work here. But somehow, it does. It’s a viscous sucking mire of jacked-up, jacked-in Gibsonian tropery, and the Bloober art team balances Observer’s fetishistic gratuity without slipping into parody. And when Lazarski does what an Observer does — port into the craniums of recent victims to wring clues from their deteriorating cortices — the visual symphony hits overdrive. It becomes a vignette of heavily fractured abstractions, where the player pontoons across shards of lingering consciousness. Observer is at its most disorienting when clambering around the head of a fresh corpse. While some might find it heavy-handed, I was continually tantalised by the audio-visual frisson. Admittedly, that’s only part of the investigative process. Lazarski’s augmentations provide a couple of helping analytical hands. Lots of ratting around crime scenes, piecing together clues to further the search for the killer, and for Lazarski’s son. Hauer keeps you company as you plunge on, assessing and appraising with his unique inflection. It’s not a perfect game. There are a couple of stealth sections that feel a touch incongruous with the overall pace of the experience, but they’re not insurmountable nor particularly long. The claustrophobic aesthetic with also will not be to everyone’s liking, particularly with some of the environmental puzzle-solving. If you’ve ever read Richard Calder’s Dead Things trilogy — to my mind, Observer’s best literary analogue — or wanted to see hints of Warren Spector’s One City Block concept mashed into Cronenbergian techno-surrealism, get thee to Krakow. This game isn’t even six months old! Hauer was fantastic in this, but I didn’t finish it because the “observer” sequences just way, way overstayed their welcome. I thought they were great. Granted, I tend not to play these types of games very often, whatever you’d classify this particular blend of…walking sim? FP adventure?..as, so there was probably a novelty factor. Hauer was awesome in this, though, yeah. Last game that caught my attention in the same way was Cradle? And if we’re talking about welcomes being worn out, I still furrow my brow at that bizarre injection of first-person cube shooting. Otherwise, wonderful, despite the abbreviated ended. Oh, and yeah, I probably should of gone for something much older to inaugurate the BSTN retrospectives, but felt the itch just to tardily nod in Observer’s direction. Bullet Points alerted me to this one.